Figuring out how to pay for college is something that most people struggle with. There’s a lot of information to take in. Luckily for Connecticut residents though, the process may be a little bit easier thanks to all the great programs available to you. For example, you have options of federal, state, and private funding sources. We’re going to explain all of these options so you can have a better understanding of what they all mean. Are you ready to embark on your college journey? Let’s talk about the four steps all Connecticut residents should take to fund a college education. Regardless of your financial situation, the first step on every student’s financial aid checklist should be to fill out the FAFSA. FAFSA stands for Free Application for Federal Student Aid. FAFSA might seem like the hardest part of the financial aid process, but it is also the most important. Let’s be real, FAFSA is not super fun to fill out, but it has lots of benefits. For example, just by filling it out, you’ll automatically be qualified for some aid such as federal grants, federal subsidized and unsubsidized loans, and some state grants. If you find yourself feeling a bit overwhelmed when filling out the FAFSA, you might want to check out our step-by-step guide that will explain how you fill out every question. There’s no need to hesitate when applying for the FAFSA. In fact, the sooner you fill it out, the better. Some grants have application deadlines that you don’t want to miss. Plus, you don’t even need to know which school you’ll be attending in order to apply. As we mentioned in step one, filling out the FAFSA will automatically qualify you for some forms of state financial aid, but not all. That’s why it’s a good idea to also do some research on your own to see if there are other programs that might be available. Minority Teacher Incentive Grant is available to minority juniors or seniors enrolled in a Connecticut teacher preparation program. Along with grants, Connecticut also has scholarships available to residents. Roberta B. Willis Scholarship - Need and Merit-Based Award for Connecticut residents with a high school junior year class rank of 20% or better, and/or SAT scores of at least 1210, or ACT score of at least 27. Roberta B. Willis Scholarship - Need-Based Award for Connecticut residents who attend a Connecticut public or non-profit private college. Recipients are chosen based on their Expected Family Contribution (EFC), which is a number you will receive from filling out your FAFSA. For more information about these Connecticut grants and scholarships, see the Connecticut Office of Higher Education’s website and scroll to the chart towards the bottom. Guidance counselors can be a great resource when it comes to finding local scholarships. If you’re a high school student, be sure to regularly check in with your counselor to stay up-to-date on local scholarships. Another smart idea is to do your own searches online. There are so many scholarships available, you just have to find them. You can search scholarships by major, interest (such as theater or music scholarships), scholarships for athletes, etc. Many Connecticut colleges also offer their own scholarships. For example, here you can find a list of scholarships from the University of Connecticut, and here you can find a list of scholarships from Southern Connecticut State University. CollegeScholarships.com has a great variety of local scholarships for Connecticut, including scholarships for certain counties. For example, New London County has 51 scholarships available just for county residents. For a complete list of scholarships by county, you can go to the link above and scroll to the bottom. Sallie Mae's Scholarship Search is a constantly updated scholarship database that can be a big help in your hunt for scholarships. You might also want to check out Big Future by College Board. They offer scholarships and other forms of aid from more than 2,200 different programs. Big Future can also be helpful if you’re stuck picking a major and want to start exploring different careers. 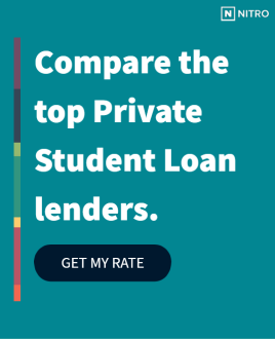 If you’ve exhausted your options between grants, scholarships, and federal loans, a private student loan can help cover the remaining costs. Before taking out a Connecticut private loan, check out our free NitroScore tool. It can give you an idea about how easy or difficult it may be to pay off your students loans after you graduate. The tool is very easy to use. Simply enter a college and a major, and the tool will tell you your total cost of education. In addition, it’ll lay out your projected salary after graduation and how much of your salary per month will go towards paying off your loans. From all of this, you’ll receive a score that will tell you how easy or difficult it may be to pay off your loans. You can also customize the results of the score by adding other factors such as scholarships and other savings. After using the NitroScore tool, you can compare rates from our highly trusted loan partners and figure out who can give you the best rate. A college education can be attainable goal for all Connecticut residents. You can’t start the process too soon, so start planning for your future today.